I don't remember meeting Donnie. As an active teenager in district events in the Church of the Nazarene in the 1980s, there were all these kids from different churches at events and over time you got to know them. That's how I met Donnie. 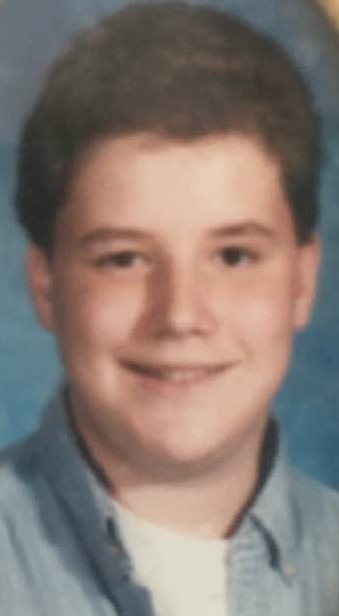 We went to summer camp together, and I think, like many girls, I had a tad bit of a crush on him. I mean, who wouldn't? He was adorable, tremendously funny, and had a spiritual side of him that I wished would be shown by the boys in my youth group who were more interested in armpit farts than actually worshiping during the Sunday morning church service. I never admitted my small teen crush to Donnie, although I often joked with him that I fell for him. Indeed I did. The camp tabernacle had a cement floor painted gray. I remember the ash color vividly. It was Thursday night of camp, my last camp before heading to college, and I was trying to make sure I said goodbye to everyone before service that evening because I knew Friday mornings were hectic and not conducive to departing sentiments. There had been a thunderstorm and rain had blown into the area in front of the pews. We were required to dress up for evening church at that time, and my dress shoes were not a good combo. As Donnie and I separated from a hug, I took a step back and forgot momentarily about the slick floor. . . until I landed at his feet. Evidently he had girls falling for him all the time, because by the time social media was invented and we reconnected, he had completely forgotten (or blocked) the incident from him memory. I feel cheated as Donnie was younger than me and was more into the singing groups of the district and I was into Bible quizzing. 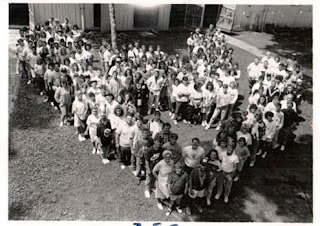 I have only one photo where the two of us together -- the official camp photo for the 1990 West Virginia North South Districts of the Church of the Nazarene senior high teen camp. I went to a different Nazarene college than he, and so while many remember hilarious pranks he pulled on others, the funniest memory I have with him is of my doing. Yet, I cherish my friendship with this man. Perhaps I saw a side of him others didn't. We traded jokes on Facebook, but privately we were a huge support for each other. My mother was on dialysis and dying of heart failure. The mother he loves dearly is present in body but absent in a mind wrecked by Alzheimer's. He sent my husband and me the very first wedding gift I received. It was because of that I decided to splurge on custom made guinea pig wedding cake toppers. He always joked with me about my love of guinea pigs and it seemed appropriate to use his gift for such. Yet with all the joking around he did, the one thing that always stood out to me was his deep faith. It was quiet -- a life of faith lived by words and actions. But that quietness about his faith ran deep. Like many, he held memories of camp at Summersville, WV very dear. My husband and I went to family camp last year, and I spent the week texting Donnie photos and comments. The hard holiness-keep-you-awake pews of your youth had been replaced with padded comfy ones. I texted him a photo and said "When we were kids, we had pews that went uphill both ways." There are some conversations I have had with Donnie that are too private to share. One of these was a conversation I had shortly before Donnie passed away. During it, I felt like he was telling me how much my friendship meant to him. I will forever cherish that. Less than two weeks later I woke and thought, "I need to check in with Donnie. I haven't heard from him in a few days." I picked up my phone on April first, and saw an alert that I had gotten a private message from another friend of mine from teen camp. I felt like I had been punched in the gut. I hadn't even read the message which just said, "Did you see the post on Donnie's wall?" I knew something was very, very wrong. I went to Donnie's wall, and I read a message that made no sense to me. I had to read it several times. His sister was posting from his account. He had passed away suddenly, unexpectedly at home. The autopsy revealed pancreatic cancer which had spread to his liver. I message my friend and said it was April Fool's Day. She said he was a jokester but not cruel. I read that message dozens of time as hundreds of comments were made. I kept hoping somewhere, at some point to see him pop in and say "Gotcha" -- but like my friend said he wasn't cruel enough to play a prank like that. All of us who knew him are heartbroken. A life with no more Donnie in it is unfathomable. Yet, I am thankful for my grief. It means I knew him well enough there will be a emptiness left by his passing. I'd rather grieve and have known Donnie than to not have these feelings and have never been able to meet this wonderful friend. My grandfather always refused to say goodbye because he said that was final. He instead said, "So long." As I wrote on Donnie's Facebook page, "Godspeed, until we meet again at that Beautiful Isle of Somewhere". Beautiful tribute to a life long friendship. So sorry for your loss. I am so sorry for your loss. Beautiful tribute.